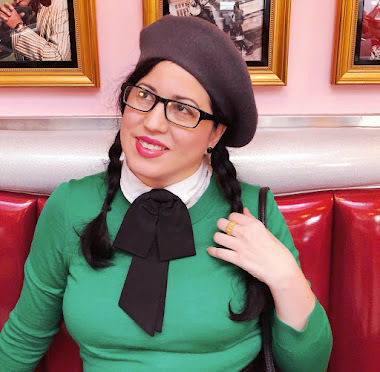 Yesterday I shared with you a little peak into my Valentine's day outfit for my special day out and I showed you one of the brooches in my Valentine's brooch collection. Now let me show you the rest! My collection is still small but that's because I am a particular person. I love my brooches to be celluloid or some form of vintage plastic and I love them to each have a meaning for me. This one below is a double heart brooch with a religious medallion on it. The medallion I found to be poetic almost as if the brooch means two loves entwined and protected by their faith. It may be my own interpretation but I love it nonetheless. I found this next one to be so cheeky that I HAD to have it hehe I mean how cute is this!!?? This last one is my pride because...drum roll please....I scored it for $30 dollars!!!!! A 1930's Valentine's day brooch which has hearts that spin around! It's in amazing condition for its age. I found another seller that is selling it for over $150 dollars. So I know I scored big! I know many of you know that feeling of when you find that vintage something that you have been looking for ages and finally finding it. I am very pleased with my collection so far. I also found two others that are fabulous as well. Aren't they neat? What sort of vintage brooches do you collect? Are there any that you are looking for but never seem to find? What is your best score yet? These are thoroughly fantastic! I especially adore (and have long pined for one as well) the super charming hourglass one. Aww, I feel even more festive now - thanks, doll! Hello. My name is Daffny and I am an Artist. Valentine's Date with a Cuppa! AVN Book Club: Hello Gorgeous!